CARACAS, Venezuela — For a glimpse into Venezuela’s economic disarray, slip into a travel agency here and book a round-trip flight to Maracaibo, on the other side of the country, for just $16. Need a book to read on the plane? For those with hard currency, a new copy of “50 Shades of Grey” goes for $2.50. Forget your toothpaste? A tube of Colgate costs 7 cents. But for the majority of Venezuelans who lack easy access to dollars, such surreal prices reflect a tremendous currency devaluation and a crumbling economy expected to contract 7 percent this year as oil income plunges and price controls produce acute shortages of items including milk, detergent and condoms. “I’ve seen people die on the operating table because we didn’t have the basic tools for surgeries,” said Valentina Herrera, 35, a pediatrician at a public hospital in Maracay, a city near Caracas. She said she planned to look for other work because making ends meet on her salary of 5,622 bolívars a month — $33 at a new exchange rate unveiled recently — was impossible. Faced with tumbling approval ratings as Venezuelans reel from the economic shock, President Nicolás Maduro is intensifying a crackdown on his opponents, reflected in last week’s arrest of Antonio Ledezma, the mayor of Caracas, and his indictment on charges of conspiracy and plotting an American-backed coup. Mr. Maduro, a protégé of President Hugo Chávez, who died in 2013, has adopted an increasingly shrill tone against critics of Venezuela’s so-called Bolivarian Revolution. 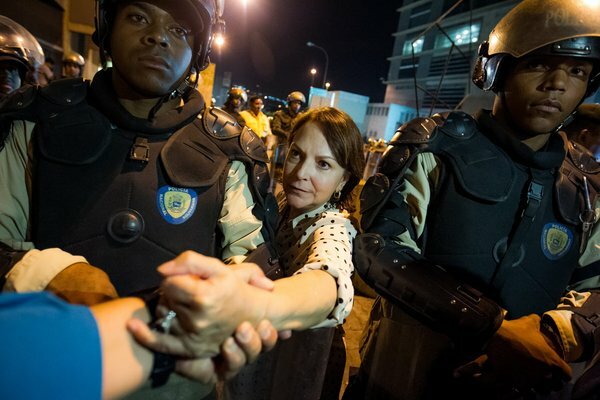 As evidence against Mr. Ledezma, Mr. Maduro pointed to an open letter this month calling for “a national agreement for a transition” that was signed by Mr. Ledezma; Leopoldo López, another opposition figure who has been imprisoned for the past year; and María Corina Machado, an opposition politician charged in December with plotting to assassinate Mr. Maduro. Mr. Maduro is taking a page from Mr. Chávez, who was briefly ousted in a 2002 coup with the Bush administration’s tacit approval, then made attacking Washington and locking up people suspected of being putschists a fixture of his government. But the State Department has disputed Mr. Maduro’s claims, saying the United States is not promoting unrest in Venezuela. At the same time, the move by Mr. Maduro points to a hardening in how opposition figures here are treated. Thirty-three of the 50 opposition mayors in the country are now facing legal action in connection with antigovernment protests last year that left 43 people dead, according to Gerardo Blyde, the mayor of Baruta, a Caracas municipality. One prominent opposition mayor, Daniel Ceballos of the city of San Cristóbal, has been in jail for the past year, while another, Enzo Scarano of the industrial town of San Diego in Carabobo State, was transferred from jail to house arrest last month because of deteriorating health. The arrest of Mr. Ledezma, 59, who was democratically elected but had much of his authority stripped away in 2009, has even some pro-Chávez analysts questioning the wisdom of Mr. Maduro’s move. While Mr. Ledezma joined a hardline faction of the opposition last year called “the Exit,” he was not viewed as especially prominent or influential. With inflation soaring to a rate of 68 percent, the Venezuelan authorities are seeking to manage the economic crisis with a complex web of three official exchange rates. For instance, some basic goods are imported at rates of 6.3 and 12 bolívars to the dollar, but a new floating rate of about 171 was introduced last week, effectively reflecting a devaluation of nearly 70 percent. On the black market, which some Venezuelans already use to carry out basic transactions, the rate is even higher. 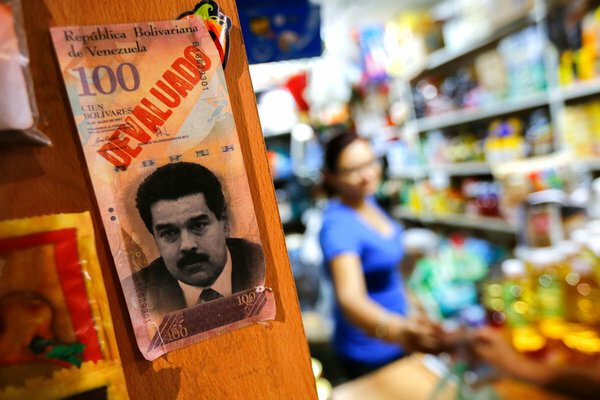 Even for some Chávez loyalists, Mr. Maduro seems to be in over his head in dealing with the scramble for hard currency. Jorge Giordani, one of the late president’s top economic advisers, said this month that Venezuela was emerging as Latin America’s “laughingstock,” citing corruption and labyrinthine bureaucracy as factors accentuating the economic quagmire. “We need to acknowledge the crisis, comrades,” said Mr. Giordani, whom the president ousted last year as finance and planning minister. Indeed, some economists say that the government’s hesitance to overhaul its perplexing currency controls could intensify Venezuela’s economic problems. “The system is going haywire,” said Francisco Rodríguez, chief Andean economist at Bank of America Merrill Lynch, emphasizing that galloping price increases could soon enter the realm of hyperinflation, accelerating to triple digits this year and to more than 1,000 percent in 2016 if policies are maintained. Mr. Maduro seems to recognize that some profound economic changes are needed in Venezuela, which commands the world’s largest oil reserves, creating the illusion of inexhaustible wealth. He supports raising the price of gasoline, which costs less than 10 cents a gallon at the strongest official exchange rate; there is considerable resistance to such a shift even though the fuel subsidy costs the government more than $12 billion a year. But ahead of congressional elections this year in which Mr. Maduro’s supporters seem vulnerable, the president is also seeking to shore up his base. 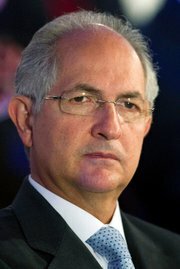 Mr. Ledezma’s wife, Mitzy, told Reuters on Sunday that the president was showing his dictatorial tendencies. “He knows that every day there are more opponents,” she said. Despite the widespread complaints about hardship and high levels of violent crime, some here remain loyal to Mr. Maduro out of gratitude for a vast array of social welfare programs. “I’ll vote for Maduro until I die,” said Marco Miraval, 77, who sells coconuts in 23 de Enero, a sprawling housing complex that is a bastion for pro-Chávez groups, pointing to Mr. Maduro’s support of subsidized university education and health care. He said Venezuela’s economic problems were a result of Washington’s pressure on the government. “It’s because they’re being sabotaged by this economic war,” he said. Still, while Venezuela’s opposition remains divided and hampered by the arrests of some leading figures, Mr. Maduro lacks the oratorical skill of Mr. Chávez, who skewered his opponents in what often seemed like a stream-of-consciousness approach to governing that kept many Venezuelans on the edge of their seats. In the meantime, bizarre prices persist for many basic services, punishing those who earn and save in bolívars while benefiting an elite with access to hard currency in bank accounts abroad. For instance, monthly broadband service from the state telecommunications company costs less than the equivalent of $1. The monthly electricity bill for a huge luxury apartment, with air-conditioning on at all hours, comes to less than $2. Even that absurdly cheap flight to Maracaibo is more complicated than it appears since some airlines have trouble obtaining the dollars they need to maintain their planes. “You’ll see things you’ll never believe: half a dozen aircraft from just one airline just waiting on the ground because they don’t have parts,” said Nicolás Veloz, a pilot based in Caracas. A version of this article appears in print on February 23, 2015, on page A1 of the New York edition with the headline: Amid a Slump, A Crackdown for Venezuela. Posted on February 23, 2015, in Postings. Bookmark the permalink. Leave a comment.